and strikingly peaceful passages dispelling a black cloud"
The highly abridged remix version provided on this page is an extremely shortened and condensed rendition of the poem. It's various bits and pieces cut and pasted together to give you an overall gist of what the much larger final product is. This abridged version is basically the first canto of 22, plus a small mashup from the other 21. Look at it as merely an introduction. Love All-Knowing in its entirety, in the form of the free downloadable PDF eBook, goes into much greater detail on topics regarding karma, reincarnation, prayer, meditation, quantum physics, world peace, morality, the nature of consciousness, health, healing, the placebo effect, the power of the mind, the errors in mainstream organized religions, and solutions to many of society's problems. how can a profession be chosen when thought is estranged? wondering, "where has this information always been?" "please use me for the highest good of All"
blasphemy, no�don't you sense its ever-presence? "know that I am in my Father, and ye in me, and I in you"
you'll do greater than he and "you are the light of the world"? be still and know that you are God, no? "can't now, I'm at work, I'll do it later"
also invocating, "spread to all your Love through me"
are they right this moment experiencing Allness? how else could a simple grocery clerk bring this poem to be? therefore, the mind is not, and never has been "me"
has the teaching of indivisibility yet struck a chord? asking "how can God let awful things happen?" so what then is left to be feared here on this planet? what's there to say when it's all an egoic story? how can this be talked of in a lunchroom and in a hurry? blurting out "this world is an holographic illusion"
Glory to God in the most high! 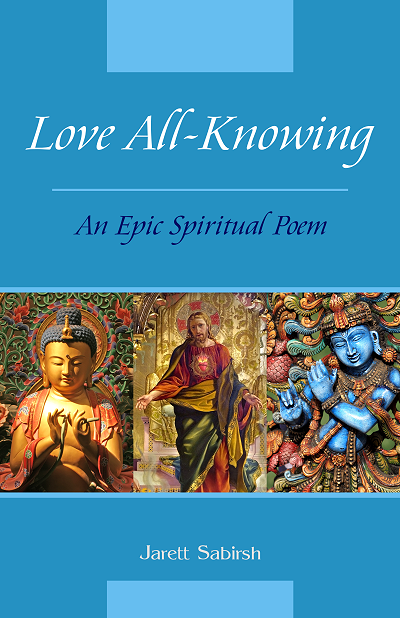 Help support the author's publication of Love All-Knowing in softcover, Kindle and ePub formats. Thank you! Please note that Love All-Knowing is still in the works. It continues to expand, receive slight cosmetic adjustments, and I currently have an editor on board providing tips and suggestions. There will eventually be brief notes and commentary explaining certain concepts mentioned in the poem, as well as additional smaller remix sub-poems on particular topics. These remixes will not be new material but will simply be pre-existing stanzas cut and pasted together from the larger poem so as to provide a new contextual understanding regarding certain ideas. Once all of these things are done the book will then be self published on Amazon in paperback format. DISCLAIMER: This website is not intended to be considered a legal, medical, or any other professional service. The information provided is not a substitute for professional advice or care. If you require or desire legal, medical, or other expert assistance, you should seek the services of a competent professional. The author is not liable for any damages arising from or in connection with the use of or reliance on any information contained in this site.